Several weeks ago our family drove to Prince William County for my son’s travel soccer game. We exited I-66 near Manassas and soon turned onto Brentsville Road near the county sports complex. 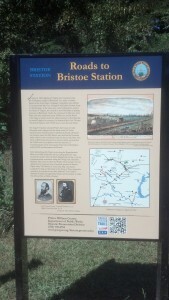 Just before crossing the tracks of the former Orange & Alexandria Railroad I noticed a Virginia Civil War Trails sign beckoning me to turn left into Bristoe Station Battlefield Heritage Park. However, I had to continue on to the soccer field. At halftime of my son’s game I saw my opportunity to go on a battlefield adventure and I am glad that I did. I pulled into the small parking lot and picked up a walking trail map out of the nearby box. A nearby historical marker noted the nearby graves of Rebel soldiers [Mississippi & Alabama troops I believe] who had succumbed to disease while manning the lengthy defense lines in 1861 and early 1862. A circular walking trail named “A.P. Hill’s Folly” meanders along the ridge and field just west of the railroad. The brochure notes that the trail is 1.3 miles long and will take about 1.5 hours to complete. A quick math calculation spurred me to begin the hike knowing that I could walk the distance in much less than the allotted time. I also didn’t want to miss the second half of my boy’s soccer game, so hustle I did. The Battle of Bristoe Station took place on October 14, 1863 [150th anniversary coming up] when General Robert E. Lee’s Army of Northern Virginia, reinvigorated with fresh supplies and troops since the Gettysburg fight in July, went on the offensive and nipped at the heels of General George Meade’s retreating Army of the Potomac. General Ambrose Powell [A.P.] Hill’s Confederate Third Corps led an assault against the Union rear guard commanded by General Gouvernour K. Warren. But Hill’s men walked into an ambush because many of Warren’s 2nd Corps troops hid behind the screening embankment of the railroad. Unwitting Confederate infantry marched northeastward along the ridge leaving their right flank open. The brutal enfilade fire mauled two North Carolina brigades from Henry Heth’s division [BG John Cooke & BG W.W. Kirkland]. Hill ordered Major David McIntosh to unlimber an artillery battery on the ridge while Southern reinforcements double-quicked to the scene. Blue-clad troops soon overwhelmed Hill’s infantry and overran the cannons. More than 1,300 Confederates fell dead, wounded or missing even though Federal troops soon continued their withdrawal toward Centreville. For more info visit The Civil War Trust. 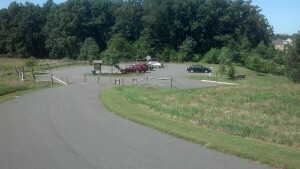 For mobile tour app see visit this Prince William County Park site.